Food served Mon–Fri noon–9.45pm; Sat/Sun noon–9.45pm. Agua, located on the ground floor of the Apex City Hotel, may not be able to compete with the peerless view of Edinburgh Castle offered by its sister restaurant, Heights, in the Apex International, a few doors down. But Agua does offer a well-considered and affordable menu with a determined focus on Scottish, seasonal ingredients. The theme has recently expanded beyond fish and seafood to include meat and vegetarian options, and, while the menu is fairly small, there’s enough variety to suit a range of tastes. A starter of confit duck, pistachio and raisin terrine has a lovely coarse texture, its flavour enlivened by kumquat chutney and served on toasted sourdough, while hot smoked salmon is nicely offset by pickled cucumber and a bitter lemon compote. For mains there’s a juicy rump of lamb, while meaty baked coley goes well with a side order of crunchy honey root vegetables. 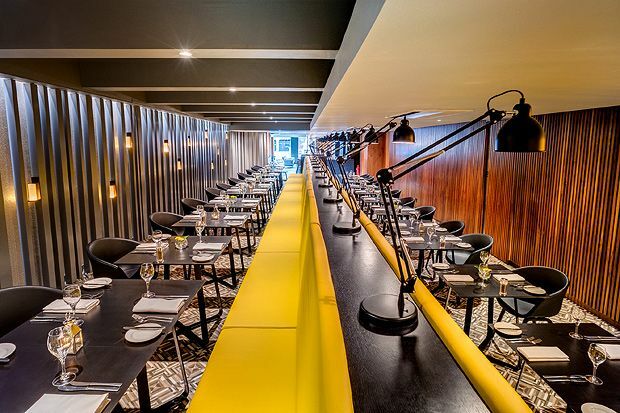 While Agua has that transitory, rather generic hotel restaurant feel to it, the quality of the food – including a very impressive range of gluten-free options – lifts it somewhat above the run of the mill. Agua Restaurant sits in the shadows of Edinburgh Castle in the heart of Edinburgh’s Grassmarket. Before sitting down to dinner in the stunning elegance of Agua Restaurant, why not toast Edinburgh with a view of the castle from the bar’s vast windows. At Agua, quality food is served with abundant class. The restaurant offers several menus, one including a 'Market dish of the day', the chef's extra special dish which changes regularly. Menus feature vegetarian and gluten-free options so that no guest 'will just have the salad'. We produce all of our dishes using locally-sourced ingredients, so that you can both enjoy the finest cuisine and support the local economy. Boasting an ‘Eat Early’ menu as well as a generous fixed priced selection and A la Carte, Agua is sure to satisfy. With an admirably international wine menu you will not be short of excellent choices to complement your food. Private dining can easily be arranged if you and your party are looking for the ultimate in relaxing dining.